CacheGuard provides a firewall, an antivirus, a proxy cache, a reverse proxy, a web traffic compressor, a URL guarding facility, a Web load balancer, a WAF (Web Application Firewall), a traffic shaper, an SSL offloader&inspector. CacheGuard provides a firewall, an antivirus, a forwarding and reverse proxy cache, a web traffic compressor, a URL guarding facility, a Web application load balancer, a WAF (Web Application Firewall), a traffic shaper, a traffic logger and much more. Integrating CacheGuard into your networks is completely transparent for end users and Web applications.At the heart of CacheGuard there is CacheGuard-OS. 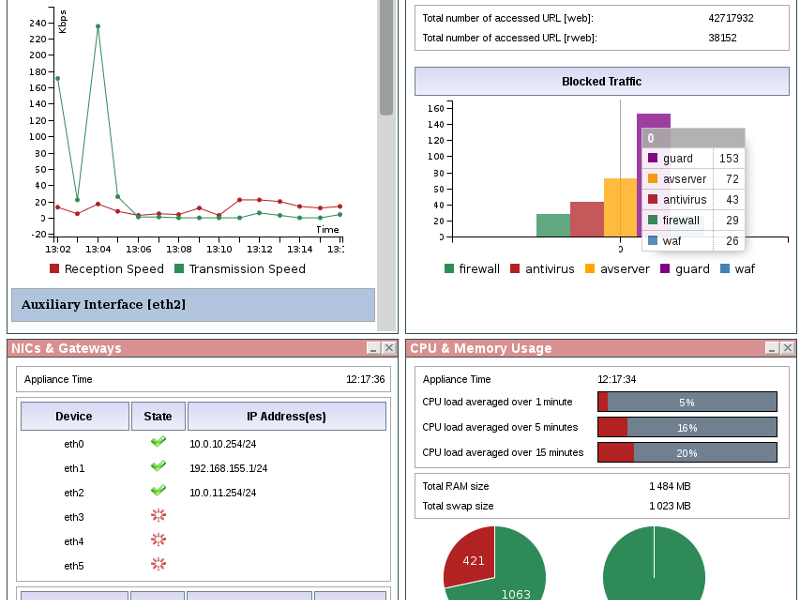 To install CacheGuard-OS you need a dedicated hardware or virtual machine. Almost all hardware and virtualization systems in the market such as Dell, HP, IBM, VMware, Hyper-V, Proxmox Linux KVM and VirtualBox are supported.CacheGuard-OS is based on a hardened Linux system built from scratch (with LFS) and integrates Netfilter, IProute2, Squid, SquidGuard, Apache, modSecurity, ClamAV and many other open source technologies interfaced together as a whole to allow an easy and straightforward configuration process using a CLI (Command Line Interface) and a Web GUI. Your bank's web site says that the information you provide can't be seen. Try pcAudit to see if this is the case. Web Padlock lets you control what Web pages can be viewed on your computer. It blocks other Web browsers ( Internet Explorer, etc.) from running. Only Web sites on Web Padlock's password-protected user-defined authorized list can be visited. SoftFuse Password Generator Free is a freeware to generate complex random passwords with ease. Using this utility, you can make new password in a click. Generate various passwords, PIN-codes, random numbers. Protect you sensitive data more securely! Free Clear History offers you a FREE solution to clear all traces of your online and offline activities, protects your privacy and improves the system performance. It supports Internet Explorer, FireFox, Windows Media Player, Yahoo, MSN, Google, etc.